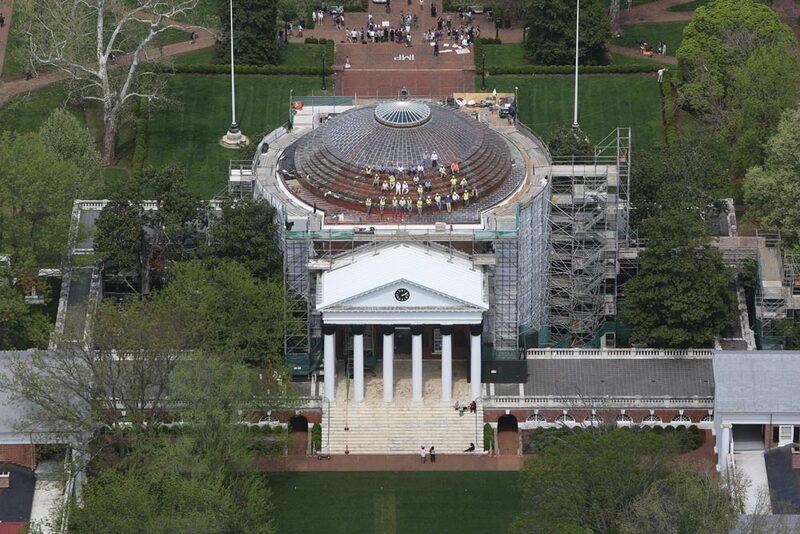 After a year of work, the Rotunda's new copper roof was finished months ahead of schedule, replacing the roof made of steel panels coated in terne—an alloy of lead and tin—that was installed in the mid-'70s. The scaffolding that surrounded the building was taken down in time for Final Exercises. 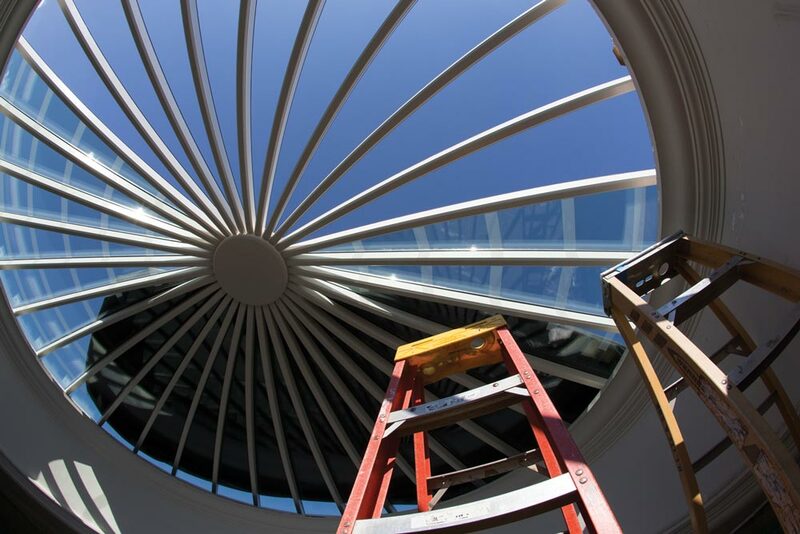 In addition to replacing the leaking roof and oculus, the first phase of the Rotunda restoration project also included repairs to the exterior brick walls, windows and ornamental sheet metal. 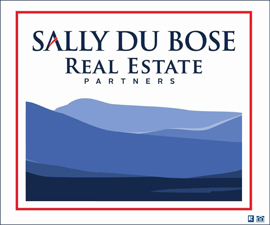 Future phases will include replacing the elevator, restoring the portico column capitals and improving the mechanical, electrical, plumbing, sprinkler and data systems. 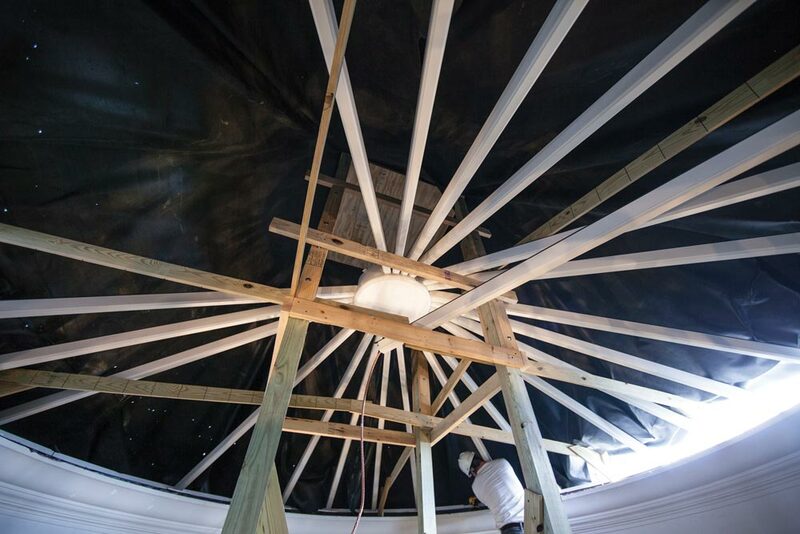 After lightly sanding the copper and applying a primer coat, painters E. Caligari & Son of Norfolk will paint the dome white with paint containing Teflon, making it more dirt resistant. The paint job should last 20 to 30 years. The full-scale project is expected to take about five years. 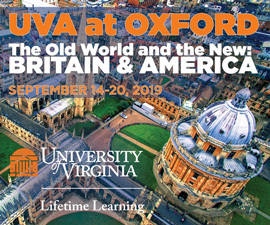 The University is currently undertaking a fundraising campaign to raise $26 million that will match funds from the state to cover the total $51 million needed for the full Rotunda renovation. Inside the Dome Rome, 48-foot high scaffolding provided access to the oculus. The scaffolding included a “bathtub” at the top, working level. During the roof and skylight replacement, temporary protection was provided using EPDM [a type of synthetic rubber] on the building’s exterior. During the oculus-replacement work, the building was more vulnerable to weather conditions. The EPDM bathtub captured any intruding water, which was pumped away without damage to the building’s interior. This supplemental system proved worthwhile following a March storm. With the help of a temporary support structure, the oculus frame is installed. Each pane weighs 127 pounds and is nearly 8.5 feet long. 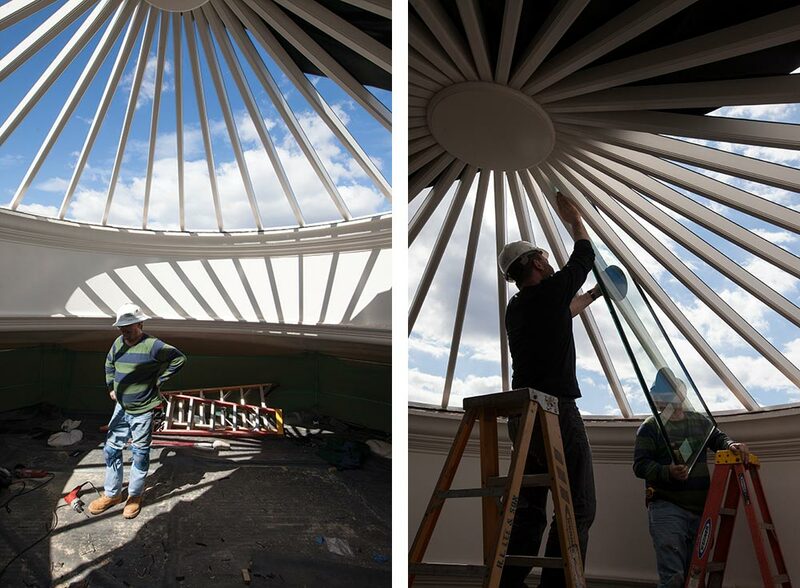 Hoisting the large panes to the top of the Rotunda dome posed a significant challenge. The installers bolted a winch to the scaffolding and secured suction cups to the glass to carefully raise each pane to the oculus. Left: The frame complete, Russ McClanahan of North American Construction Technologies pauses atop the scaffolding. McClanahan and partner Neil Dunbar completed the two-person job of installing the replacement oculus’ frame and glass panes, which were fabricated over a period of four months before arriving in Charlottesville. Right: Dunbar and McClanahan install the first of 32 panes in the new oculus. The weight of the glass panes in the oculus totals more than two tons. As the oculus nears completion, circular patterns on the glass take shape. 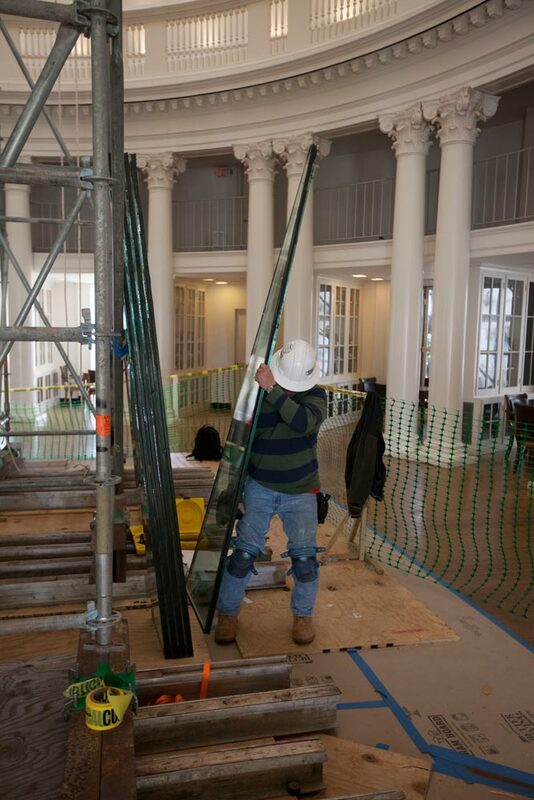 The etchings on the glass are representative of Thomas Jefferson’s original oculus, which was made with smaller, overlapping glass shingles because the technology did not yet exist to make the large panes that are currently being used. The approximately 2.5-inch overlap of the glass shingles is represented by a silk-screened pattern on an interior layer of the insulated glass. 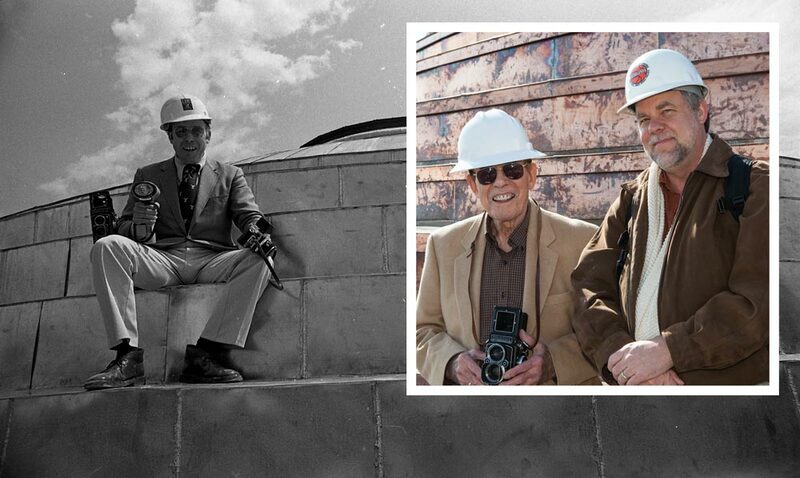 Charlottesville photographer Ed Roseberry (Com ’49) joins University photographer Dan Addison on the roof of the Rotunda to take another round of pictures of the historic building’s latest renovation (inset). 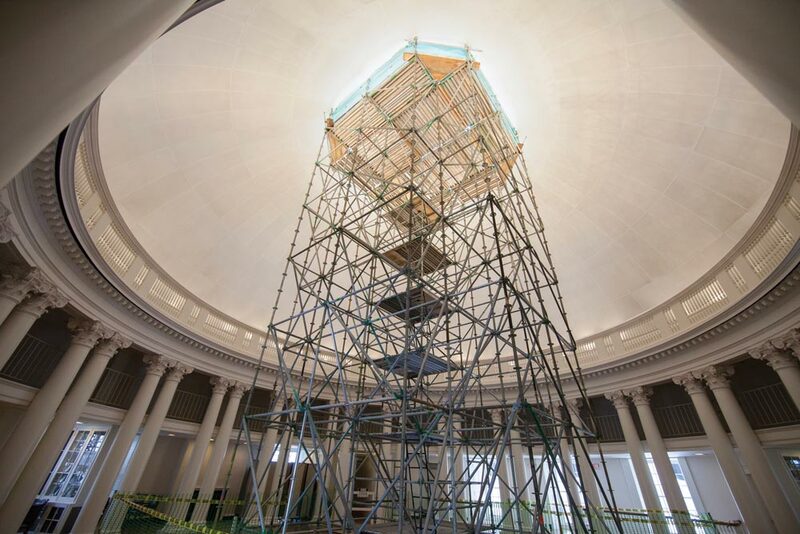 Exactly 40 years earlier, Roseberry—known for his photographs of life at UVA and in Charlottesville—photographed the last Rotunda restoration on March 19, 1973.